This article is a short summary of WarioWare, Inc.: Minigame Mania. 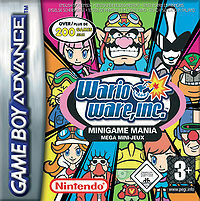 WarioWare, Inc.: Minigame Mania, known in North America as WarioWare, Inc.: Mega Microgame$!, is a game released for the Game Boy Advance and the first game in the WarioWare series of games. This page was last edited on 16 October 2011, at 20:05.